Join Estie for this fun and empowering workshop and learn to use a foam roller for what ails you! 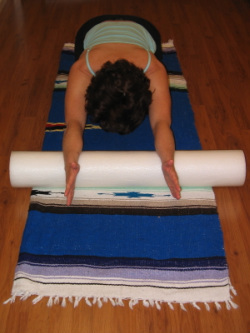 Expand your inner body dialogue with body ergonomics and a foam roller to enhance your yoga or any movement practice. Acquire a simple understanding of your body in alignment with gravity and the what changes when you become consciously aware of it. This understanding will augment your posture and free your movements of restrictions that poor posture brings. Use the foam roller as your "mobile massage therapist". A bonus to using the foam roller is that it can help to relieve everyday aches and pains, including chronic conditions. Ironically, chronic conditions may be the result of faulty posture. These skills will empower you to a new level of conscious self-care. Use the foam roller as your "mobile massage therapist" to relieve everyday aches and pains, including chronic conditions. From your head, neck and shoulders to your feet you'll learn simple movements and modifications tailored to your specific conditions or recovery. Repetitive strain injuries and carpal tunnel issues will also be addressed. These skills will empower you to a new level of self-care. Since 1987, Estie has been helping clients with an approach that uses yoga, body ergonomics, and Hellerwork Structural Bodywork to teach body-awareness and restore fluid movement to her clients. She brings a fundamental understanding of movement and posture dynamics to her classes and workshops, and specializes in working with individuals who have chronic pain and repetitive strain injuries.